The national flag of Armenia, the Armenian Tricolor (Yeraguyn) is the state symbol of the Republic of Armenia. It consists of three equal horizontal bands, the top – red, middle – blue and lower – orange (also known as apricot color). For centuries, these colors were associated with the Armenian nation. The width of the flag to its length is 1:2. The current flag of Armenia was adopted by the Supreme Council of the Republic of Armenia on August 24, 1990. 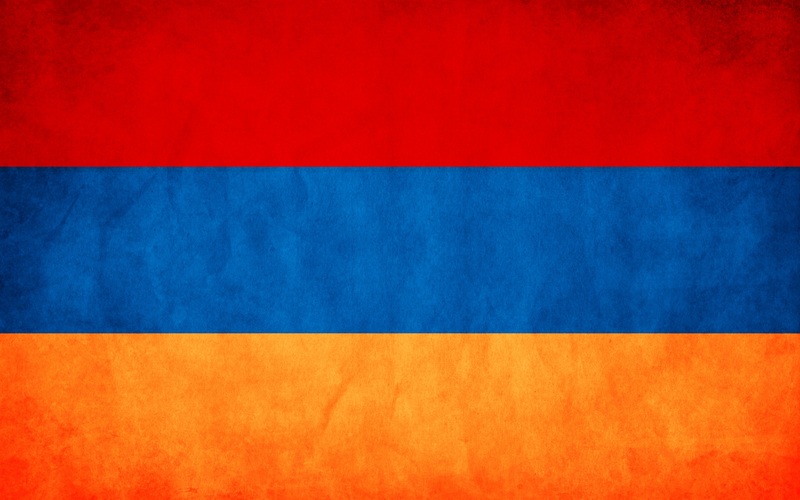 There are many interpretations of the significance of these colors, among which this one is the most widely adopted: red symbolizes the blood shed by Armenian soldiers in defense of their country, the blue symbolizes the sky of the country, and orange represents fertile lands of Armenia. Anthem of Armenia is the song “Mer Hayrenik” (Our Fatherland) approved on July 1, 1991, by the decision of the Supreme Council of the Republic of Armenia. It is based on the anthem of the First Republic of Armenia (1918-1922), but with different lyrics. The lyrics of the anthem is adapted version of “The Song of the Italian girl” poetry written in 1859 by Mikael Nalbandian (1829-1866) and music by composer Barsegh Kanachyan (1885-1967).